Rio de Janeiro’s 6th International Uranium Film Festival awarded 10 films from 8 countries: Australia, Brazil, Denmark, Germany, Italy, Spain, Switzerland and the Netherlands. Six films received the Yellow Einstein Award and 4 films the festival’s Special Recognition. In total the festival screened in the cinematheque of Rio de Janeiro’s Modern Art Museum (MAM) 49 films from all over the world about atomic power, uranium, nuclear security and radioactive risks. 13 filmmakers and producers were present in Rio. „Since the beginning of time radiation is part of human mankind. There is natural radiation coming from space and from the rocks under our feet. And because of the discovering and use of the powerful element uranium we have in addition the „man-made“ radiation coming from the contamination of our planet - for example - through mining and by more than 2000 atomic bombs that were blown up in the Atmosphere just by the five A-Bomb states USA, Russia, France, United Kingdom and China“, says festival director Norbert G. Suchanek. The Uranium Film Festival trophy is a piece of art produced by Brazilian waste-material-artist Getúlio Damado, who lives and works in the famous artist quarter Santa Teresa in Rio de Janeiro where the first International Uranium Film Festival was held in May 2011. Getúlio creates the Uranium Film Festival Award from waste material, that he finds in the streets of Santa Teresa. He uses also old watches to remember the first atomic bomb dropped over Hiroshima. Watches in Hiroshima stopped exactly at 8:15 in the morning when the A-bomb exploded on August 6th, 1945. „For the last six years our Award had the nickname Yellow Oscar. But this year in April the Academy of Motion Picture Arts and Sciences in Hollywood prohibited us the use of the name Oscar. For that we had to find a new name. For that from now on the Uranium Film Festival Award is called the Yellow Einstein“, explains festival director Norbert G. Suchanek. "With his extraordinary master piece THE MAN WHO SAVED THE WORLD, Danish filmmaker Peter Anthony pushed the borders, how documentary can be done and what it might achieve far beyond everything what was known so far. Beginning with his marvelous staged re-enactments of the very heavy situation in which Stanislav Petrov had to decide if he would take the alarm of being attacked by american nuclear rockets for real and if they had to respond or not, continuing with this something in-between of feature- and documentary film, which takes you right from the beginning till the very end, when Stanislav Petrov after decades meets his mother again, into an emotional roller coaster. The most outstanding from a filmmakers view was, how Peter Anthony pushed his difficult main character Petrov to play himself. It was a brilliant way to show the different facets of this man who decided against everything he was educated in the russian army on a purely emotional base, and who was on the other hand unable to speak about what happened with his closest family. After watching this film you realize how close mankind has been to lose our whole planet, how technical systems again and again are not reliable enough to handle neither the military use of nuclear power nor the so-called peaceful, energy-generating-use of it." Rainer Ludwigs, filmmaker and director of the award winning animated documentary „Leonid’s Story"
„The quality of the three parted URANIUM – TWISTING THE DRAGON’S TAIL was brilliant. The impressing pictures, as well as the down-to-earth-character of Wain Fimeri's presenter who explores together with the viewer the astonishing universe of uranium and the good and the bad sides of its use - the last part ended up with an irritating conclusion. Staying close to scientific facts, as the filmmaker Fimari pointed out, his visit and measurement of the house of an old couple in the forbidden zone of Chernobyl which showed no higher background radiation than the normal one, could give the viewer the impression that the long-lasting problems of radioactive emissions are much to overrated. However, I missed the longterm effects which treat the affected people still in the second and third generation, not in only one spot, in the southern area, close to the power plant, but in the much more treated northern region which was in the wind direction when the disaster happened. And where, in Belarus, the very high statistic rates of cancer and birth defects speak their own clear language, still after 30 years. But of course - this is the problem of the scientific way to handle this - not one of these could clearly related to the Chernobyl disaster. So presenting the official low numbers of deaths, how Wain did it in the end of his trilogy will ever be cynical related to the pain and misery hundreds of thousands of affected families still have to face, losing their children, their health, their homes and being stigmatized as victims forever.“ Rainer Ludwigs, filmmaker and director of the award winning animated documentary „Leonid’s Story"
"The first ever made Brazilian/US movie about the use of Depleted Uranium Weapons." The story of the first nuclear power plant 100 per cent in Switzerland ... but also the last. Alessandro Tesei, José Herrera Plaza, Marcus Schwenzel, Miguel Silveira, Missy Hernandez, Peter Anthony, Petrus Pires, Rainer Ludwigs, Reinhart Brüning, Roberto Fernández, Tetyana Cherniavska, Tineke van Veen, Wain Fimeri. About one year before the Fukushima reactor exploded, the International Uranium Film Festival (IUFF) was founded in 2010 in Santa Teresa, the famous artist quarter in the heart of Rio de Janeiro. It is the first festival of its kind that addresses all nuclear and radioactive issues. The aim is to inform about nuclear power, uranium mining, nuclear weapons and the risks of radioactivity. Independent documentaries and movies are the best tool to bring that information to a diverse international public. And a festival is the best way to bring the films to the people! The horror of atomic bombs and those who suffered from them, and nuclear accidents like Three Mile Island and Chernobyl should never be forgotten - nor repeated. Then the nuclear accident in Fukushima happened just two months before the first edition of the International Uranium Film Festival in May 2011 in Rio de Janeiro. Uranium mining, fracking, nuclear accidents, atomic bomb factories, nuclear waste: No matter if you are in favour or against the use of nuclear power, all people should be informed about the risks. The International Uranium Film Festivals creates a neutral space to throw light on all nuclear issues. It stimulates new productions, supports "nuclear" filmmaking and the discussion about the nuclear question in Brazil and worldwide. Alphonse Kelecom - Professor for radio-biologogy at the Instituto de Geociências of the Universidade Federal Fluminense (UFF) in the state of Rio de Janeiro, Brazil. He was born in Belgium and is living in Rio de Janeiro. Damacio Lopez - Founder of the International Depleted Uranium Study Team, USA, New Mexico. Hernani Heffner - Curador Adjunto e Conservador-Chefe da Cinemateca do Museu de Arte Moderna do Rio de Janeiro. Professor for Cinema at the University PUC-Rio. João Luiz Leocádio - Nuclear Engineer and Professor of the Department of Cinema & Video at the Federal Fluminense University (UFF) in the state of Rio de Janeiro. Marcia Gomes de Oliveira - Executive Director, Social Scientist, Documentary Filmmaker, born in Rio de Janeiro. The festival thanks our longterm local partners & supporters Modern Art Museum Cinematheque, Armazém São Thiago, Esquina de Santa, Bar do Mineiro, Cachaça Magnífica and also Caffè Teichner and Villa Laurinda. Special thanks to the supporters Friedrich Ebert Stiftung Brazil, Goethe Institut Rio de Janeiro, the Suiss Consulate in Rio and FAETEC. The Uranium Film Festival is only made possible with financial support from individual donors and sponsors. The legal organizer of the Festival is the non-profit arts and cultural organization “Arquivo Amarelo“, based in Rio de Janeiro and registered as Brazilian charity. We welcome any contribution. Thank you! 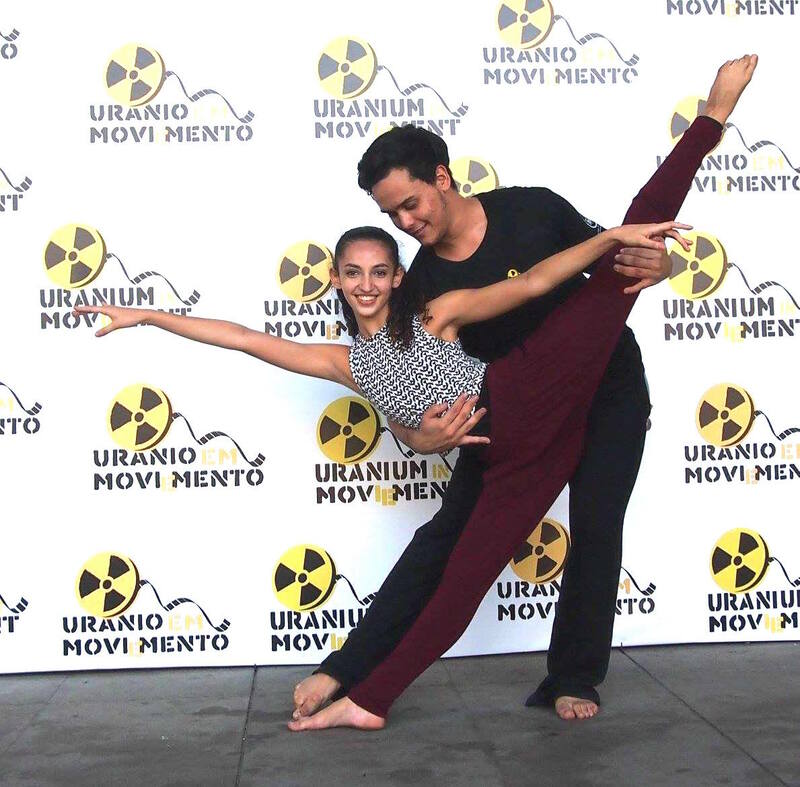 PHOTO: OPENING WITH A „NUCLEAR“ DANCE PERFORMANCE BY STUDENTS OF THE STATE SCHOOL FAETEC ADOLPHO BLOCH - Victor Mendes & Helena Paim.